Jasper Fforde's third book in the Last Dragonslayer series is an excellent fantasy which has the unusual element of being grounded in reality. Imaginary places intermingle with the names of real towns UK readers will recognize and I feel this is a clever touch which lends authenticity and credibility to the adventure set in the UnUnited Kingdoms. Likewise, magical names are mixed with commonplace ones such as Kevin and Perkins. Jennifer Strange is the sixteen-year-old protagonist whose task it is to prevent The Mighty Shandar, the most powerful wizard in the world from eliminating all the dragons. He agrees to spare them if she succeeds in bringing him the legendary jewel, The Eye of Zoltar and the reader is immediately plunged into the first of a number of adventures, coping with ferocious animals and dodging death in a variety of hair-raising predicaments. Fforde's magic is woven into the journey of chasing magical beasts such as the Tralfamosaur who is happy to eat everything in its path; reforming a very spoiled Princess whose body has been exchanged with a servant's by her own royal mother; rescuing the Once Magnificent Boo from imprisonment in the Cambrian Empire and finding the goose-egg sized ruby known as The Eye of Zoltar. The jewel has a reputation of changing all those who hold it into lead, so Jennifer is under no illusions that the task ahead will be easy, even if she and her companion sorcerers can defy the terrible odds of the 50% Fatality Index along the way. 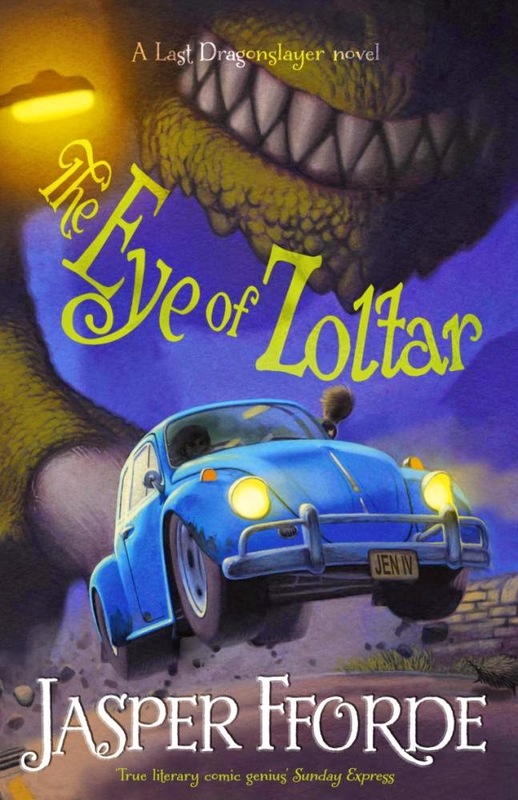 As with all fantasies, the impact of the story relies on the wild imagination and innovative ideas of the author, and there is certainly no shortage of inventiveness in Fforde's work. The reader is whirled along from one seemingly impossible situation to another, with strangers proving to be trustworthy while others are treacherous. The questers are up against dark forces and places that test every magical skill in their power. Nevertheless, the book is not without humour. The names of the two dragons Jennifer is responsible for illustrate this: Feldspar Axiom Firebreath IV and - Colin. There's lots of amusing scenarios and dialogue as well. Fast-paced, entertaining and often mind-blowing, The Eye of Zoltar will hook readers from jump-in start to the tense and satisfying finish.